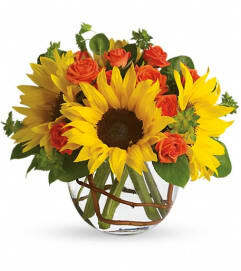 Symbolizing warmth and happiness, it is no wonder the sunflower is a quintessential ingredient in so many fall bouquets. 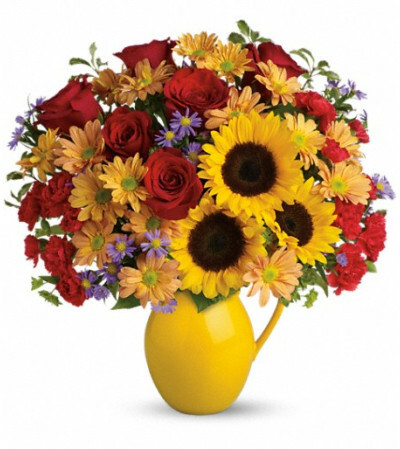 This bouquet maximizes the joy of sunflowers by arranging them with a bevy of fall flowers, it's a lovely pick-me-up for a crisp fall day. 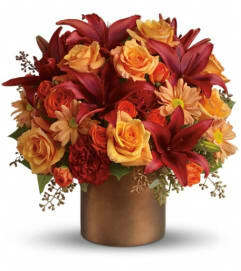 Sunny sunflowers, red roses and miniature carnations, bronze daisy spray chrysanthemums, large lavender monte cassino asters and autumn greens are beautifully arranged in a ceramic pitcher.